I’ve been working on this particular genealogical problem for at least 10 years, is the Delany who is entered in Garrett Rosa’s death record as his mother, the same women called Lena who married Abraham Rosa in Coxsackie, Greene County, New York. “2177. Abraham Roosa (son of Guert) was b.1759 Coxsackie, Greene Co., NY and was bpt. 6 May 1759 in the Coxsackie RDC. He served in the New York Line during the American Revolution. Abraham d. 7 Jan. 1855, at the age of 85. He m. Eleanor van Loon in NY. Eleanor d. 17 Oct. 1845. * You will notice that not one single source is provided for the data in this book, just the mention of a vague one. First off, I know that Garrett died in 1869 in Kalamazoo County, Michigan, and I have no idea where ‘Wadsworth Flats’ are; the entry should have been made more clear when they compiled the book. This ‘error’ makes me immediately leery of this resource as a reliable one. Well, that and the fact that there are very few sources listed. Garrett’s first wife’s name was Clarissy/Clara Cross. I know this from the death records of two of his sons. So at least that much information sort of matches the book. Again, no source as to how they know his wife’s name. As a resource the book is questionable, and that means I have to start from, mostly, scratch for at least a few generations. When Garrett died his death registration had both parents listed: Abraham and Delany Rosa. His second wife, Lucinda, is most likely the person who provided the information for the record and who knows if the clerk wrote it accurately. His mother’s name, Eleanor, from the ROOSA book could be construed as Delany, maybe, but it does seem a stretch. 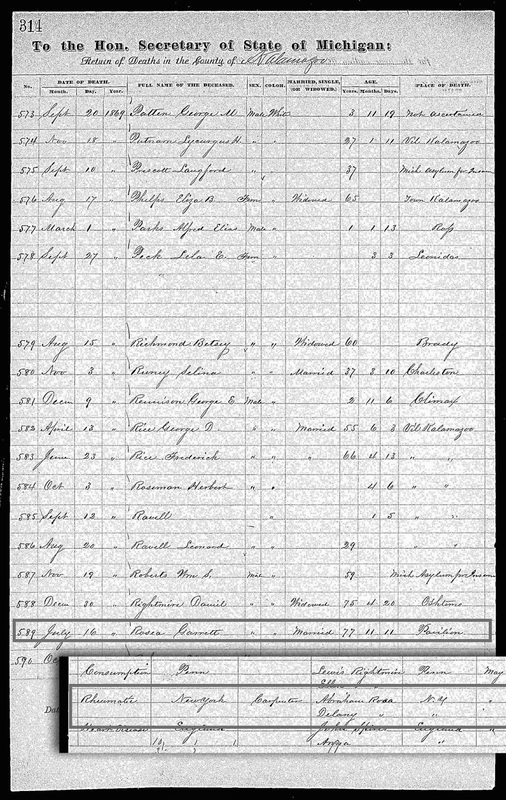 Garrett Rosa’s death registration entry in the Michigan records. To expand my research I decided to pursue the possible pension record for his, believed to be, father Abraham. I did find one in Cortland County and decided to request a copy from NARA, but as I was only speculating that this record was for the correct Abraham I didn’t get too excited. According to this pension Abraham was born in the year 1760 at Coxsackie, he lived there until he entered into the service. Later he moved to Greene in Chenango County, then Manlius in Onondaga County, then Locke in Cayuga County and lastly he settled in Homer in Courtland County, all in New York state. His son Rufus testified that his father was married twice: the first time in 1783, and then after his wife died in 1802, to his second wife Sarah _____. Rufus also stated that he was the only child of the first marriage and his sister, Amanda, was the only child of the second marriage. At no time did he name the wives and we only know Sarah’s first name because she is still around during the pension application process; thank you for nothing Rufus! Nothing in this pension would lead me to believe that this Abraham was the father of my Garrett Rosa. 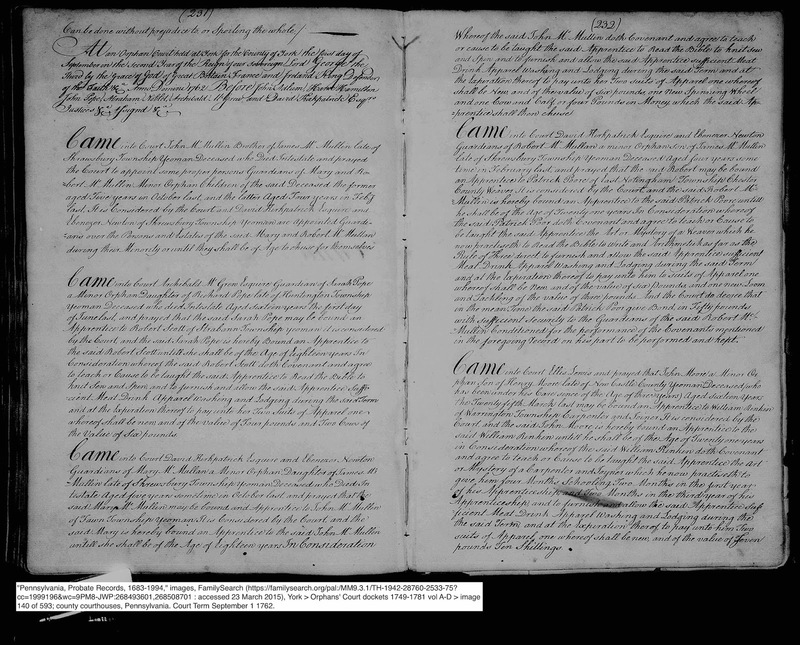 That is until I started perusing the Coxsackie Reformed Dutch Church (RDF) records, which are online (transcribed, not originals). These are the same records that are used as sources in the Roosa history book. This Guert/Garret was born pretty much the same time as my Garrett. He had a brother Rufus, there is a Rufus, son of Abraham (of Coxsackie), in the pension record. The records are in Coxsackie, the same place as is mentioned in the pension. The wife’s name in the baptismal records is Lena (or Eleanor, which is possibly an error on the part of the minister entering the data and assuming Lena was a diminutive of Eleanor). Lena and Delany seem to be a closer match. Rufus could have misunderstood the question about children, as all the other siblings were off in other states, or counties making him and Amanda the only ones left with their dad, or he just outright lied, hoping to cash in on a little pension money without having to spread it around to the rest of the family. The Rosa’s, remember, were not known for their upstanding behavior in Michigan, it could have been a family trait. The research is slowly putting itself together, helping me to feel more comfortable about his mother being Lena and this line of descent being correct. That’s not to say I won’t change my mind. I will be doing more research in Salt Lake on Abraham and his various moves using land and court records. By putting together a timeline of Abraham and Garrett I am hopeful of making the proper connection between the two. Wish me good luck.